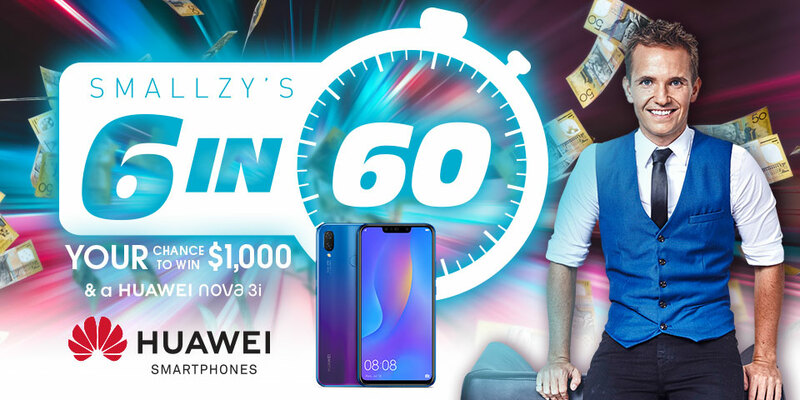 Win $1000 & a Huawei phone - Smallzy's 6 in 60 seconds - Nova - 25 wol. It’s pretty simple… If YOU get the call back, Smallzy will ask you 6 questions in 60 seconds and for each question YOU can get correct YOU win $100! If YOU can get all 6 questions correct within 60 seconds you will JACKPOT your cash and win $1,000!!! BUT… that’s not all, just for playing Smalllzy’s 6 in 60 you will win a brand NEW HUAWEI nova 3i smartphone and a pair of FreeBuds! The amazing HUAWEI nova 3i smartphone features four cameras, 128GB of storage ... and a huge battery! For YOUR chance to WIN, simply enter below and tell us in 25 words or less what YOU would spend $1,000 on if you won and why! 1. Promotion Smallzy’s 6 in 60! YOUR chance to win $1,000 & a HUWAEI nova 3i smartphone! deemed a Prize winner and awarded the relevant Prize as outlined below in Prize Details. entry (who will be waiting on stand-by) to participate in the On Air Challenge. in the On Air Challenge. - One (1) HUAWEI nova 3i in Iris Purple valued at up to $599 (incl GST). - One (1) pair of HUAWEI Free Buds wireless earbuds valued at up to $199 (incl GST). For the avoidance of doubt the Total Prize Pool will not exceed $17,980. Page created in 0.0219 seconds with 8 queries.